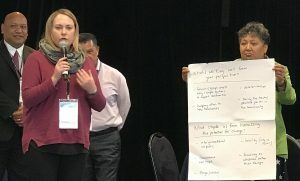 About one hundred people who’ve been involved in some way with E Tū Whānau over the last decade, came together in Wellington in June 2018 to consider the movement’s achievements and help design its future. These were kahukura, Māori who are recognised as influencers and leaders in their own whānau, hapū, rohe or area of work. They came from all walks of life and from all over the motu. Grassroots community and social workers, gang whānau, rangatahi, sports administrators, social workers and rūnunga CEOs joined forces to share ideas and experiences with iwi leaders, academics and government officials. E Tū Whānau Kaiwhakahaere, Ann Dysart, said that they all brought knowledge, expertise and an authenticity honed by their work with, and passion for, their people. “They believe in this kaupapa and want real input into developing it so that it continues to be meaningful and useful to their people,” she said. The manager of Waiwhetu Marae, Peggy Luke-Ngaheke, told the gathering that E Tū Whānau was part of her marae’s bloodline and likened it to the Kōhanga Reo movement she was part of establishing 37 years ago. The kahukura gathered to share current knowledge and thinking about the issues that affect whānau and to contribute to positive solutions by providing input into the E Tū Whānau Programme of Action (POA) for the next five years. The POA outlines the actions that Te Ao Māori have committed to undertake, those that government has responsibility for, and those that are shared. The recently appointed Director for Māori and Pacific at the Ministry of Social Development, Charlie Howe, said he was stunned by the range of people at the workshop and their kōrero. He described his experience of the kahukura hui as “learning enriched with aroha”. Group General Manager of Community Partnerships and Programmes at MSD, Marama Edwards, was also blown away at how willing people were to share their stories and experiences with government officials in the hope that they would be heard. “I came away thinking hard about how we, as a crown agency, could take notice, how we can be bold about doing things differently, trying something new and how this can be implemented across the board. 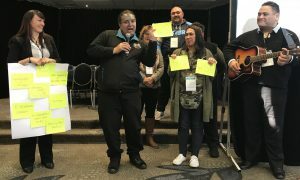 During the jam-packed day, the kahukura broke into groups to consider what aspects of the E Tū Whānau kaupapa have worked over the last decade and the direction they felt it should take in the future. Here is a taste of the rich kōrero.